Culturally Relevant Teaching | Simply Mona! Today I witnessed something that brought home to me the importance that culturally relevant teaching has on students’ level of interest, motivation, and comprehension. 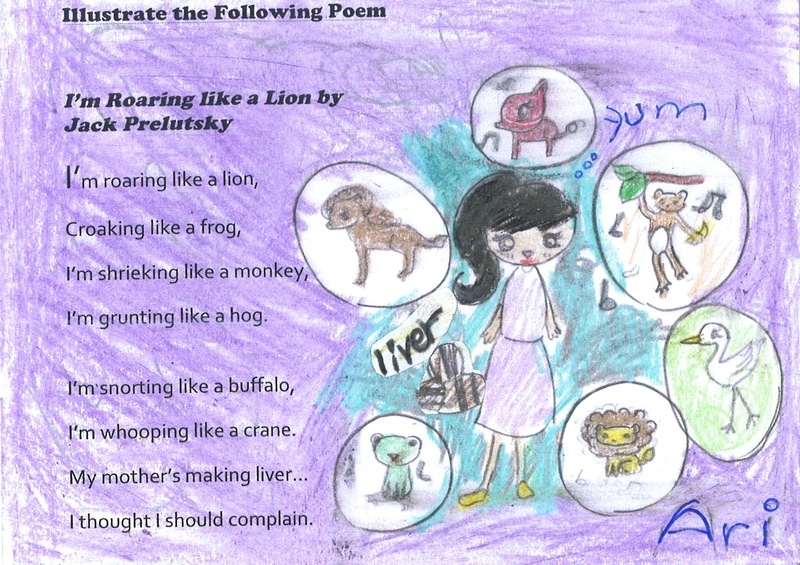 A poem by Jack Prelutsky was read during a discussion on the use of imagery to portray feelings in poetry to a Second Grade Class made up of Korean, Vietnamese, Japanese and a few American students. The poet’s intention was to illustrate the loathing of liver that a child felt, however, because 13 out of the 17 children in that classroom ate and loved liver, and had never heard of anyone not liking liver, the whole meaning of the poem was lost on them. Not being able to personally identify with the feelings of the boy not only hindered their comprehension, leading the teacher to think they did not understand the use of imagery in the poem, but went so far as to result in some kids thinking that the animal cries were symbols of the joy that the boy felt about eating liver. Following that lesson, I asked some of the children I work with, to illustrate the poem as they understand it. Included in this post are some of the drawings! This brought back memories of similar situations I’ve experienced in my 10 years of teaching abroad. One that stands out in particular took place when I was teaching a Third Grade class in Dubai. It was a lesson on measurements. I asked the students to measure things and places in and around their homes. The next day, two of the girls listed 1 kilometer and 1.5 kilometers as the size of their backyards. I confidently corrected their answers explaining that backyards would never measure a kilometer in length – it was far too big! – only to discover later that year that the girls’ backyards were in fact a few kilometers in length as were the backyards of many of the Emirati People! The other situation I was reminded of was when I volunteered with Asia Child Fund. My work consisted in introducing and training Nepalese teachers in western teaching methodologies. Prior to going, the organizers chose to base the workshops on the children’s tale Jack and the Beanstalk. Volunteer teachers had to prepare activities in math, art, science, and English around this book. When the book was read to the pupils, there was an outburst of surprise, as they could not understand how Jack could exchange a cow for a few beans – even magical beans – since cows are sacred in the Hindu culture and no one would dare trade a cow – for anything! Making one’s teaching pedagogy relevant to one’s students is of the utmost importance. Taking the time to tweak one’s lessons and examples to make them meaningful and culturally relevant is a must if one’s aim is to have a student-centered classroom where students are motivated, interested and involved. Time and time again, I witness teaching that is completely foreign to students and not as a result of language barriers. The students may understand the meaning of the words but because they cannot relate to the story, the examples, or the cultural meaning of a passage, they cannot relate to what is being taught and remain disengaged and removed from the learning. Educate not one or two of your students but educate all who sit in your room today. Begin by becoming aware and familiar with the diverse cultures in your classroom and let that be the guide to your pedagogy!